It was a quiet night for us last night with our NHL Tips, as we pushed on our only bet. Thanks to Vincent Lecavalier for scoring with 12 seconds to go in regulation time last night, tying the game 2-2 and getting us a push on our Over 5 as the Kings beat the Sharks 3-2 in OT. That was Lecavalier’s 4th goal in 9 games with the Kings, and it’s nice to see him producing offensively once again. Since we joined Twitter last week, we’ve been noticing quite a few more signups to our email and Twitter followings. If you’re a Facebook user, it’d be great if you could ‘Like’ us on there too so we can spread the word a bit more and help more people win at NHL betting. Our Facebook page is https://www.facebook.com/NHLTips.ca. And don’t forget, we offer more than just free NHL Betting Tips. 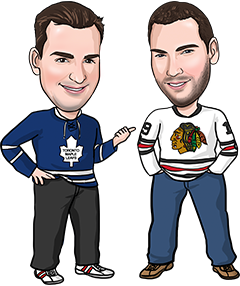 We’ve got a lot of articles and sportsbook reviews on our site designed to help you become a better hockey bettor and make money taking advantage of sportsbook bonuses. Make sure to check them out! In tonight’s action, there are just 6 games and not a lot that we really like on the board, so we’re going with 2 tips today. We wanted to tip the Rangers against the Sabres but it’s the second game of a back to back for New York, the status of Nash is up in the air and there’s a chance Raanta will be in net for New York. If Nash and Lundqvist play, we’ll probably be on the Rangers in either regulation time or on the puck line, but we couldn’t pull the trigger yet. We also think Detroit has a good chance to beat the Islanders and that there’s a lot of value on Calgary in Dallas, but passed on both of those as well. This is more of a play against the Flyers than it is on Boston. Philly’s a streaky team and they might be beginning a cold streak, especially how they lost their last game. The Flyers led Pittsburgh 2-0 before allowing 4 straight goals to the Penguins, eventually losing 4-3. The city of Philadelphia has also been affected by the heavy snow storm on the east coast, so we’re not sure the Flyers players have had 100% focus on hockey the past few days. Boston hasn’t exactly been playing lights out lately but the Bruins have still won 4 of their last 5. They’re scoring goals again (15 in their last 5) and they’re motivated to avenge a 3-2 loss in Philly earlier this month. We think they get their revenge tonight. We were on Montreal to beat the Leafs Saturday night, and won in a shootout. As happy as we were to cash that ticket, you could tell by the relief on the Habs’ faces that they were even happier. That win snapped a 5-game losing streak and sometimes it just takes 1 win to take the pressure off. Montreal has outshot 6 of its last 7 opponents so it’s not like they’re playing badly. We think most of the Canadiens’ problems these days are psychological, so we hope to see them play a bit more relaxed tonight. It’s not hard to build a case to bet against the Blue Jackets, but we’ll do it anyway. They’re banged up, including in net where Bobrovsky is on injured reserve. They’re 1-4 in their last 5 at home, and 2-7 in their last 9 overall. They’v also lost their last 4 games against Montreal, and 5 of their last 7 home games against the Habs. Hopefully, those trends will continue again tonight.